What is Sinew Herbal Ice? Sinew Herbal Ice is a safe and effective topical herbal remedy specially formulated to reduce redness, swelling, and inflammation from sprains, strains, muscle pulls, contusions and closed fractures. 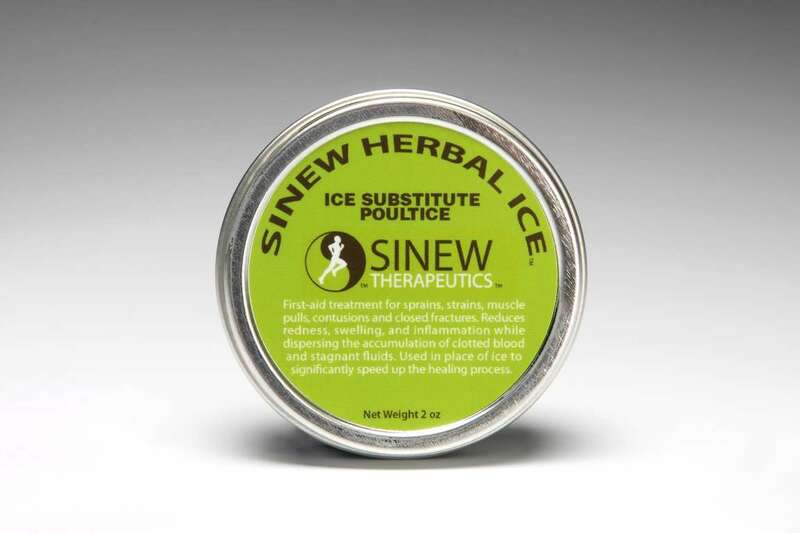 Sinew Herbal Ice contains cooling herbs to reduce swelling and inflammation while dispersing accumulated blood and fluids to help restore normal circulation to the injured area. This first-aid ice alternative poultice (balm) reduces the swelling and inflammation more effectively than ice, allowing you to more quickly regain range of motion in the injured area. Ice is not recommended because it does not help repair damaged tissues and keeps everything in the injured area frozen, causing the stagnation of blood and fluids and the contraction of muscles, tendons and ligaments. These side effects slow healing and increase the chance of re-injury and the development of chronic pain. In Chinese sports medicine ice is not used and is considered a culprit in injuries that don’t heal well. * First-aid ice alternative used in place of ice to significantly speed up the recovery and healing process. * Reduces redness, swelling, and inflammation while at the same time disperses the accumulation of blood and fluids. * Assists the healing of torn soft tissues, such as tendons, ligaments and muscles, by stimulating the restoration of circulation to the injured area. * Promotes quicker injury recovery. How do I use Sinew Herbal Ice? Apply a layer of the herbal poultice over the injured area. Cover with gauze or paper towel and wrap with rolled gauze or tape into place. Leave on for 6-24 hours (can sleep with it on), then 6-24 hours off to allow the skin to breathe. 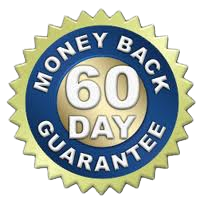 Repeat applications for up to 3 days if necessary. Full instructions are on the label. Acute Sinew Liniment can be used in-between applications. 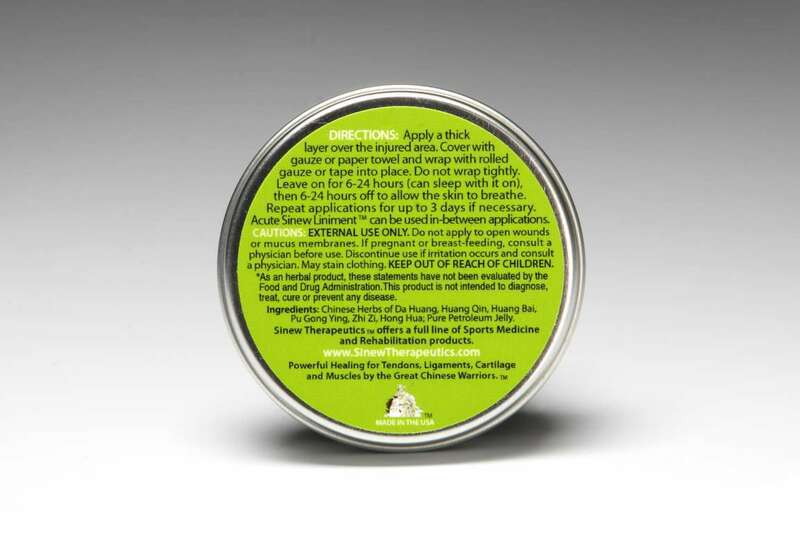 Sinew Herbal Ice contains the following laboratory-tested Chinese herbs in therapeutic dosage: Da huang, Huang qin, Huang bai, Pu gong ying, Zhi zi, Hong hua; pure petroleum jelly. Results are felt within the first day or two. How is Sinew Herbal Ice different from other pain relieving products on the market? In conventional medicine, many pain relieving products are aimed at just treating the symptoms, such as by providing an analgesic effect on the injured area to reduce the sensation of pain, thereby masking the pain. Sinew Herbal Ice contains Chinese herbs that kill pain, but painkilling herbs are not mere analgesics that mask pain.